LA PUENTE, CA – More than 15 Don Julian Elementary students applied geometry, engineering and computer science skills to program spherical multi-colored robots to navigate around a maze on the classroom floor during the opening week of Makerspace – an extracurricular class that allows students to explore coding with hands-on creating and building. Makerspace is open every day for 30 minutes during recess, with each grade level gaining access to the class on different days. Students earn tokens allowing admission to the classroom from teachers for good behavior and demonstrating school expectations, ROAR: Respectful, Orderly, Attentive and Responsible. 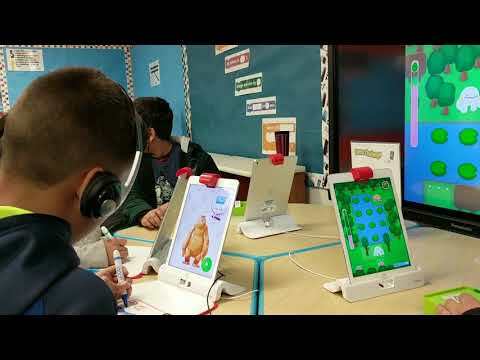 Students experiment among five stations, including an interactive iPad gaming system Osmo and four robot kits: Pro-bot cars, Bee-bot bumble bees, Sphero bots and Wonder Workshop’s Dash robots. Some robots are equipped with a xylophone and the capability to navigate objects, while others respond to voice commands and can recognize other robots. Each station has a learning goal for students to achieve. Every four weeks the challenges change to build on the students’ skills and present new opportunities for critical thinking. Makerspace was created to introduce students to coding and to strengthen math and technology concepts taught in daily instruction. Technology integration specialists Michael Jephcott and Tom Covington helped to bring the tech space and lessons to Don Julian. 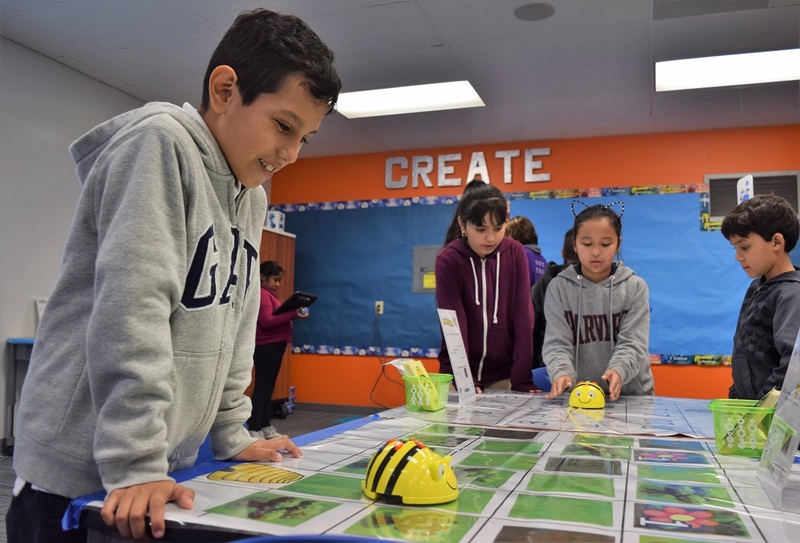 Arceo plans to acquire more robotics and coding equipment for the 2018-19 school year and eventually have teachers incorporate the lessons in the daily curriculum. 041918_BASSETT_DJMAKERSPACE1: Don Julian Elementary students experiment among five coding and robotics stations, including the interactive iPad gaming system Osmo, during the opening week of Makerspace, an extracurricular class that allows students to explore coding with hands-on creating and building. 041918_BASSETT_DJMAKERSPACE2: More than 15 Don Julian Elementary students applied geometry and computer science skills to program bumble bee robots to navigate a map during the opening week of Makerspace. 041918_BASSETT_DJMAKERSPACE3: Don Julian Elementary students learn to program Wonder Workshop’s Dash robots, which can navigate objects and recognize other robots. 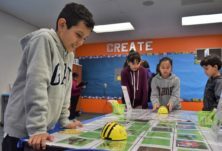 More than 15 Don Julian Elementary students applied geometry and computer science skills to program bumble bee robots to navigate a map during the opening week of Makerspace. 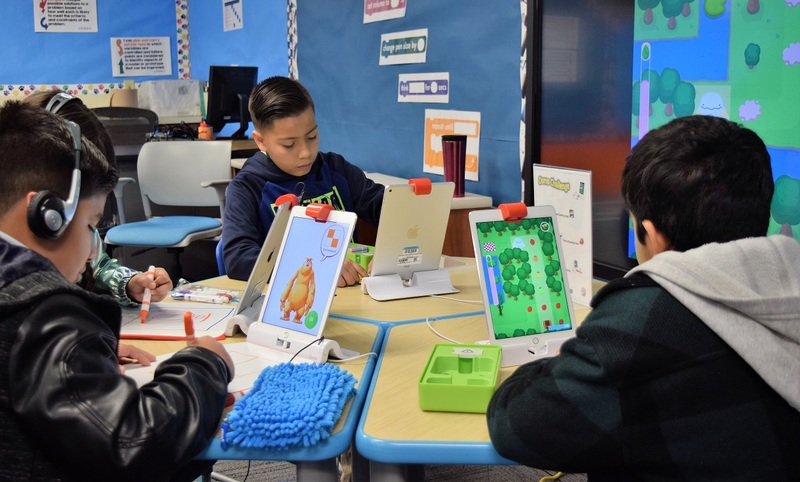 Don Julian Elementary students experiment among five coding and robotics stations, including the interactive iPad gaming system Osmo, during the opening week of Makerspace, an extracurricular class that allows students to explore coding with hands-on creating and building. 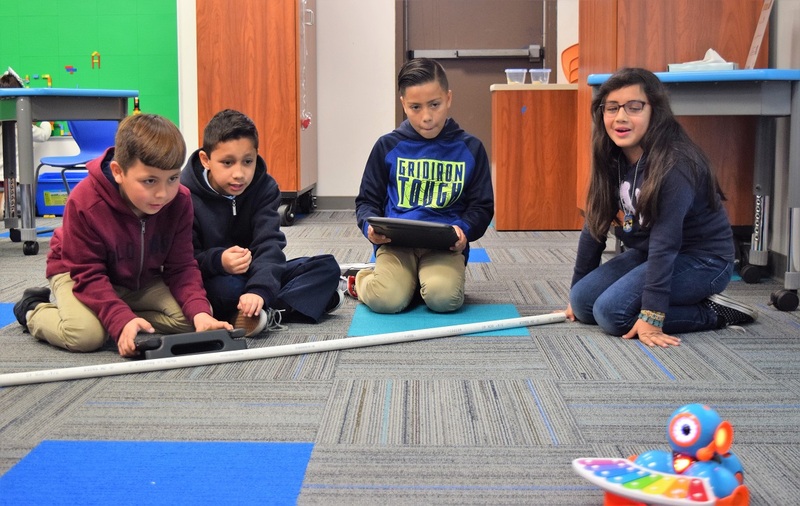 Don Julian Elementary students learn to program Wonder Workshop’s Dash robots, which can navigate objects and recognize other robots.